Funky Lunch was born out of the desire to turn an ordinary lunchtime sandwich into something a bit different to encourage children to eat a varied and healthy lunch. We all know how stressful meal times with children can be and most of the time their reluctance to finish their food is down to boredom. Young minds need inspiring, so we decided to create a whole new food experience for them. Since we first appeared in the media in 2009, Funky Lunch has received global publicity and our concept has helped children develop their taste buds to enjoy a wider range of foods. Our book is now available in shops, online and overseas. At Funky Lunch we are passionate about creating a fun educational brand that encourages children to eat healthy and enjoy what they eat. 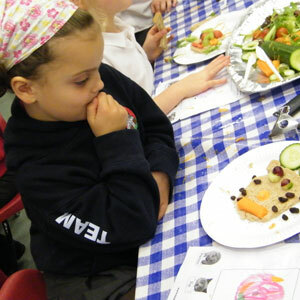 Our Creative Food Workshops will allow children to discover new foods and to get creative with their culinary ideas. We are in the process of developing our birthday kits and party consultant network which will allow you to incorporate nutritious ingredients into your childs birthday, creating a unique activity party and showing them how good food can still be fun food. In the meantime, if you want to try and incorporate new foods into your childs meals or just cure that lunchbox boredom, have a look at our gallery of images and then either join the facebook group, follow us on twitter or just pass the link on to your friends and family.